If you buy this item and decide you don't want it. Cover Sizes - 13.4 cm x 8.3 cm approx. not been kept in a protective sleeve and has discolouring & wear (see scan). Awkward to find to Tasmania from minor places in Eire. Leslie RSO Fifeshire cds 30 July 1909. Note contents and Leven back cds. Rarity factor 350. PORT ELIZABETH receiver. GB POSTCARD 1907 POSTED ON "LA MARGUERITE"
Standard: £1.00 (at own risk under £40.00). Standard: £1.65 (item under £40.00). Standard: £2.50 at (item under £40.00). Signed for : £7.95 (item over £40.00). 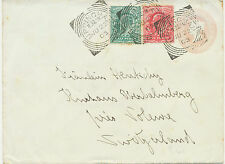 1911 GB postcard with Caldy / Tenby scarce Island rubber postmark. Standard: £1.65 (item under £40.00). International Signed for: £7.95 (item over £40.00). Standard: £2.50 at (item under £40.00). Signed for : £7.95 (item over £40.00). Standard: £1.00 (at own risk under £40.00). Signed for : £7.95 (item over £40.00). Standard: £2.50 at (item under £40.00). Rest of World. International Signed for: £7.95 (item over £40.00). Standard: £1.65 (item under £40.00). Note: vertical filing fold centrally. txzj pxzj444 txzj-11 txzj77 txzj115. Signed for : £7.95 (item over £40.00). Standard: £2.50 at (item under £40.00). King Edward VII 1909 NORWICH SORTING CARRIAGE UP Railway CDS. Signed for : £7.95 (item over £40.00). Standard: £2.50 at (item under £40.00). A 1904 PRICE’S Palmitine Candles advertising Newspaper wrapper King Edward VII Half Penny Green, sent to Germany 10 June 1904. Standard: £1.00 (at own risk under £40.00). Standard: £1.65 (item under £40.00). H&B CS26 unused cat . GB WILTSHIRE 1904 CALNE SKELETON . Amateur pen and ink drawing on back but quite unusual 'VIEW OF SNOWDON' - minor surface marks.